While there has been much discussion about an explosion of Earth observation satellites over the next few decades, much of that has centered around developing countries starting their own programs or existing countries adding to their capacity. New developments with smaller and cheaper satellites are now promising a surge of commercial space-based imagery platforms at a global scale. A number of factors are at play with this rapid expansion, including: cheaper and more accessible satellite technology, more satellite launch choices thanks to the commercialization of space, a greater awareness of the insight these imaging platforms afford in a rapidly changing world, and better web-based visualization and mapping systems that are ready to ingest and analyze near real-time imagery. This trend toward smaller satellites has been happening over time, with much of the innovation taking place in developing countries where affordability has been the key driver. However, there are now several venture capital-backed U.S.-based companies that are set to make inroads with recently announced plans for multi-satellite constellations with global coverage. These for-profit satellite constellations are fueled by the interest in more and more data for greater insight on global change, led by industries that are gaining market advantages through ongoing monitoring. The timing is ripe now as it matches the changes in computing capacity afforded by cloud computing, and new analytical tools that can make sense of these “Big Data” feeds. See article Changing the Economics of Space about the unique business model of SSTL . click here The trend toward smaller satellites has been led by the efforts of Surrey Satellite Technology (SST). 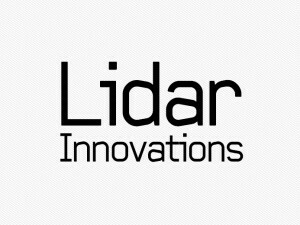 This 30-year-old company has built a reputation for both small satellite construction and satellite constellation deployment, having success as the makers of the commercial RapidEye satellite imagery constellation, as well as their own spin-off company Disaster Monitoring Constellation International Imaging (DMCii). The company has now ramped up their presence in the United States, with the launch of SST-US. “As we move forward, the role of the small spacecraft is becoming more important,” said Dr. John Paffett, CEO of SST-US. “That’s largely because every year the technology improves, with better computers and storage and payloads. The technological evolution improves, price points continue to come down, and now with a small 150-300 kg spacecraft for $10-20 million, you can do what you were doing with a 1,000 kg spacecraft five to 10 years ago for $500 million.” DMCii was developed by SST as a constellation of satellites that fill a unique niche with 32-meter resolution that is compatible with Landsat, and a three-band imager to assess vegetation health. 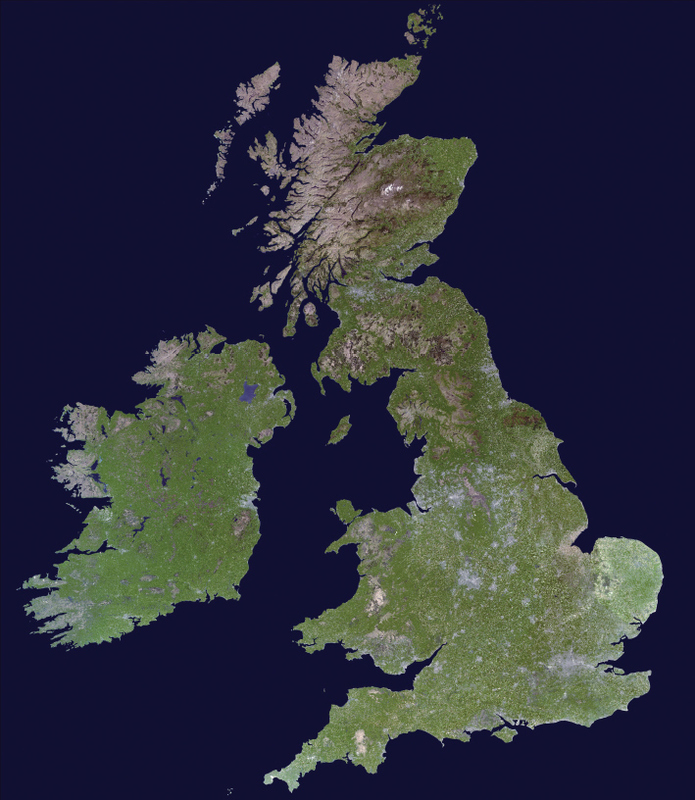 The constellation’s advantage is that it has a very large swath width to capture an image tile that is 600 km by 600 km, and can capture the same image for the same part of the Earth every day. See Figure 1.
https://mysonginthenight.com/songwriting/ order now The first-generation of four satellites were launched in 2002, another satellite was launched in 2005 with greater imaging capacity, and a sixth was launched in 2012. A second generation of satellites was launched in 2009 as NigeriaSat, with greater pixel density and 2.5-meter resolution panchromatic and 5-meter multispectral imagery. This imagery is owned by the Nigerian government and licensed to and sold by DMCii to enhance their offerings. 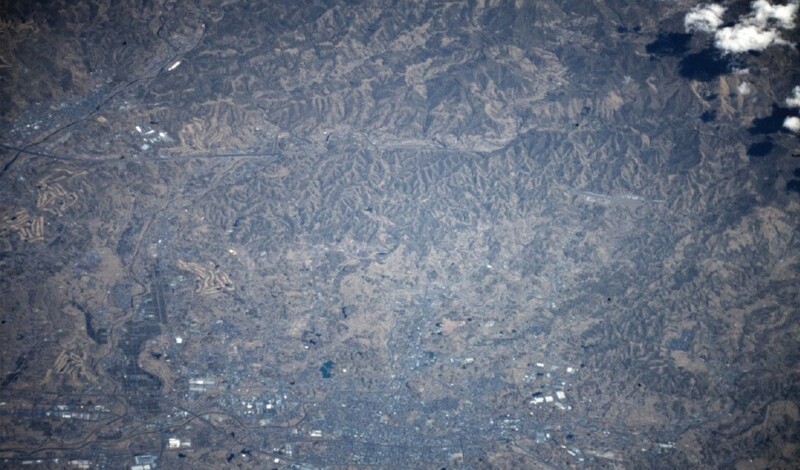 RapidEye offers 5-meter imagery, with five spectral bands, from its constellation of five identical earth observation satellites that were launched in 2008. After issues with its financial backers related to the economic downturn, the Blackbridge Group, Canada, acquired the assets of RapidEye AG, and are marketing their solutions primarily toward natural resources, targeting agriculture, forestry, and the environment as well as energy, security and infrastructure. See Figure 2.
click here MacDonnell Range, Australia. 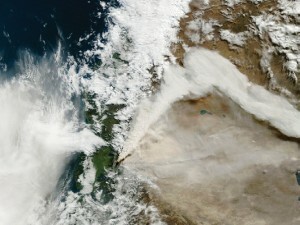 Image collected November 14, 2012 at 5-m resolution, courtesy of RapidEye. Skybox Imaging (http://www.skyboximaging.com) is based in Silicon Valley, with headquarters near both Google and Microsoft. The Skybox executive team met at the Stanford MBA program, and includes veterans of both NASA and the Pentagon. They have raised $91 million in venture capital funding, with a plan to reduce the complexity of space. They are building their own micro satellites of around 120 kg in size, with the ability to collect color imagery of less than 1-meter resolution. They are aiming to see manmade objects that move on a daily basis, including the ability to collect high-definition video up to 90 seconds in length at 30 frames per second. They decided to build their own satellites, because they couldn’t find a satellite provider to deliver the performance at the price point that they needed, likening the sourcing and integration of the components of their satellites to the build- ing of agile software. See Figure 3. Skybox satellites SkySat-1 and SkySat-2 in the company’s clean room. “We’re really building a data platform where our sensors and satellites are enablers for that data stream,” said Ching-Yu Hu, director of marketing and customer relations, Skybox Imaging. Their talent is skewed toward high-performance data platforms, with software engineers who have worked with Yahoo!, Netflix and Shutterfly. 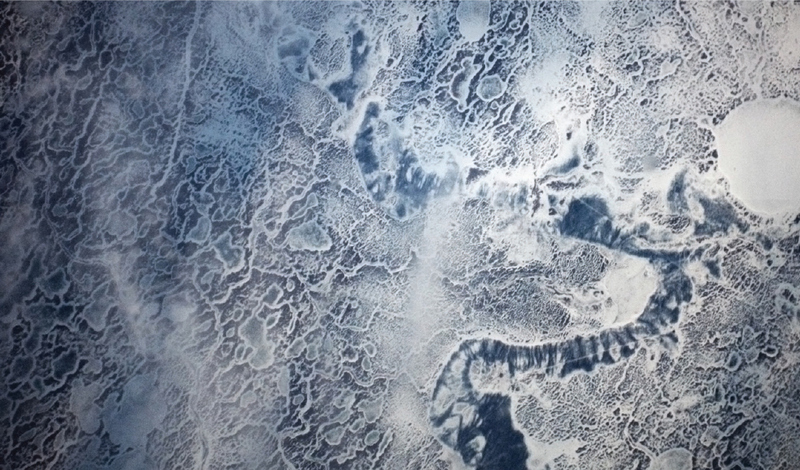 There are also imagery scientists on staff who are working to extract data from imagery to provide solutions. The first Skybox satellite is scheduled for launch from Russia at some point this Fall. With their small size, these satellites can be launched as multiples from the same rocket, and their first two launches (the second being tentatively scheduled for first quarter 2014) will be secondary payloads. As their business plan to launch a constellation of 24 satellites progresses, they will be deploying multiple satellites at the same time from the same rocket. The company is working to partner with existing companies in the satellite imagery space to grow the market. They have signed a contract with Japan Space Imaging, a subsidiary of Mitsubishi Corporation, and have delivered a “Skynode” ground station to that company that will allow them to directly task the satellite for their region, designating what areas to capture. Planet Labs (http://www.planetlabs.com) plans to launch a fleet of 28 cube satellites (CubeSats) at the end of this year. The company has raised $13 million in venture capital, and has already launched two trial satellites for test runs with Dove-1 and 2 launched in April of this year. 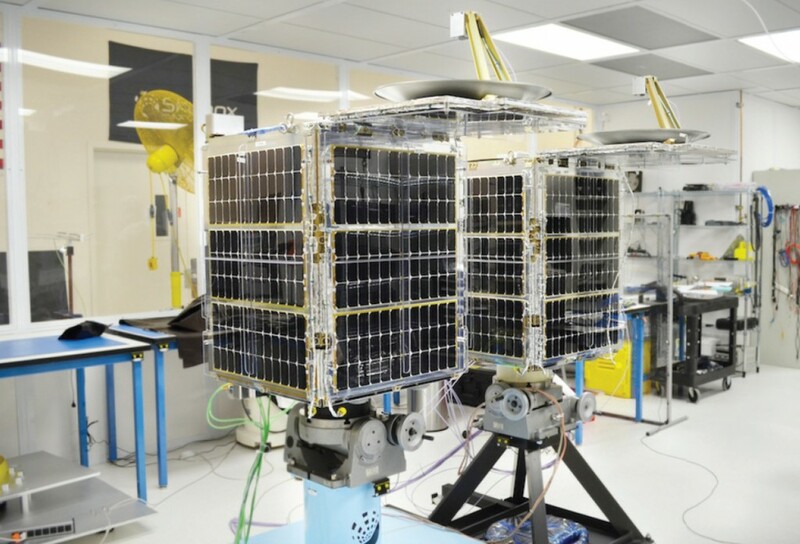 Two more Dove satellites will be launched by the end of the year, and the entire constellation of 28 satellites called Flock-1, is set to launch early next year from an Antares rocket when it makes a cargo trip to the International Space Station. See Figure 4. One of the CubeSats, similar to those that will make up the planned Flock-1 constellation, in Planet Labs’ clean room. “After realizing the commercial potential of small satellites to revolutionize Earth imagery, the founders left NASA to raise money for their new venture,” said Tracy Nguyen, marketing and communications manager for Planet Labs. “They are makers at heart, so their method is to build, test and iterate quickly—on both hardware and software—using demonstration satellites as servers, pushing new code to them every day.” See Figures 5-6. These sample satellite images were captured by a test CubeSat called Dove-2 that was launched in April of 2013, courtesy of Planet Labs. 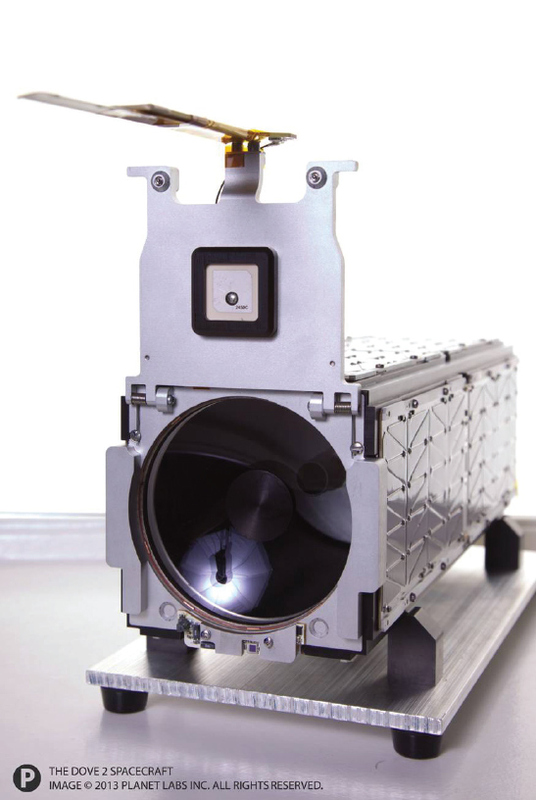 The CubeSat size has seen other entries this year, including the Strand-1 from Surrey Satellite with an Android smarphone as the processor, and Nanosatisfi (http://www.nanosatisfi.com) as an on-demand service to launch CubeSats. Nanosatisfi offers a full week’s access to their CubeSat, with a programmable Arduino board, for just $250/week, and they’ve raised $1.2 million in funding to make the vision possible. Kickstarter crowdfunding efforts have been popular for CubeSats. SkyCube, a project from Southern Stars (http://www.southernstars.com/skycube/ index.html) met its goal of $100K in funding and will launch in late November from the International Space Station. SkyCube has an imagery sensor that can be tasked via an iPhone application, which is fitting since a project designed and funded by Southern Stars makers is one of the more respected iPhone and Android astronomy applications. See Figure 7. Part of their plan is a balloon that will inflate upon re-entry to allow users to see the satellite with their naked eyes as its orbit decays, and to track the satellite path with their smartphones. 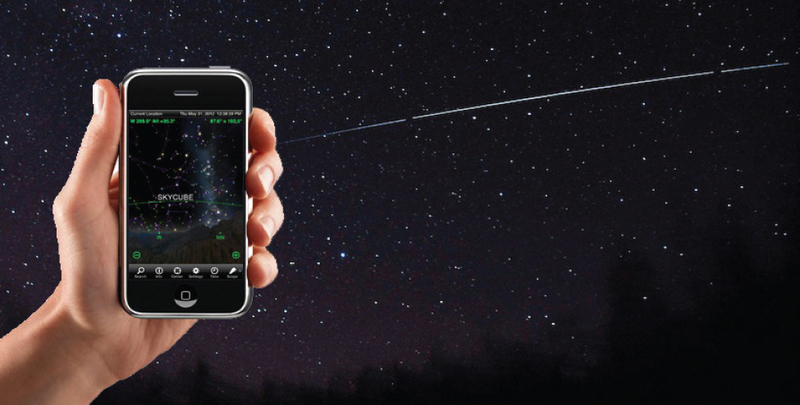 Southern Stars is mission lead on SkyCube, and also maker of the popular astronomy app SkySafari. ArduSat is another Kickstarter-funded CubeSat that raised more than $100K, which was well beyond their $35K goal. This effort is again powered by an Arduino board, and is focused on powering applications and research projects. ArduSat has partnered with MySpectral, a group that is developing an opensource spectrometer, to offer a unique sensing capability for this size satellite. The CubeSat size and configuration have been adopted widely by the academic community as a class project for scientific experiments and educational hands-on instruction. There is legislative action to remove some restrictions on these satellites for broader international adoption and interaction, taking away their military classification. The annual CubeSat gathering (http://www.cubesat.org) is in its third year, and will take place next spring at Cal State Poly in Pasadena, Calif.